GAF Camera & Film Kitchen Sink Ad 1965 this is a December 3, 1965 advertisement. It is a nice black and white ad from General Aniline & Film Corporation of NY. 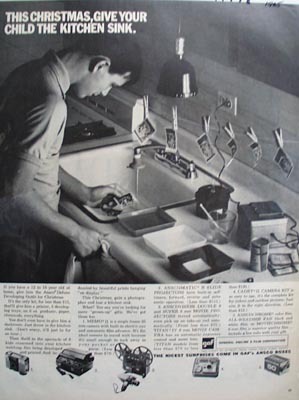 Shows a boy developing pictures in a sink and it reads, ""This Christmas, give your child the kitchen sink"". If you have a 12 to 15 year old at home, give him the Ansco Deluxe Developing Outfit for Christmas. In excellent condition. Photo is taken through plastic and may show wrinkles or crookedness that is not in the ad. This magazine tear sheet measures 10 1/4"" wide by 13 3/4"" tall. Items Similar To "GAF Camera & Film Kitchen Sink Ad 1965"